• Tim Pahuta (’10-’12) was named the American Association’s Hitter of the Month for June after he hit .396 with 11 home runs and 26 RBIs in 26 games. • Zach Walters (’12) was selected to represent the Syracuse Chiefs as an International League All-Star. • As a thank you to “special people doing heroic acts”, the Senators have announced that this Monday they will host their first ever Community Day. All firefighters, police, EMTs, teachers, nurses, doctors, hospital workers and members of the Armed Forces and their families can attend the noon game for free. • According to the Denver Post, Miguel Batista (’93-’94) has latched on with the Rockies’ AAA Colorado Springs although nothing has been made official yet. • Stephen King (’11-’12) was signed by Pahuta’s team, Sioux Falls, and has primarily played second base for the Canaries. 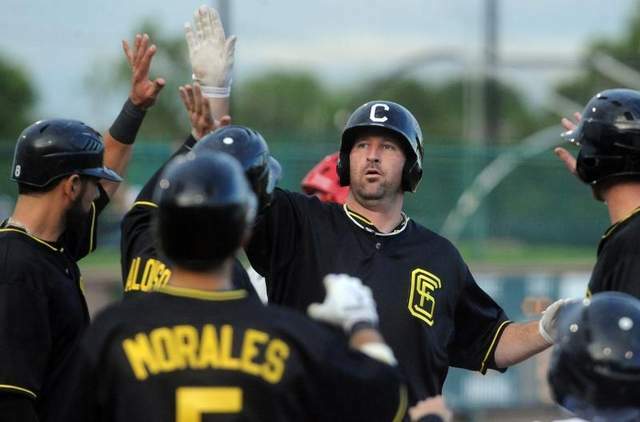 • Despite leading the Broncos de Reynosa in home runs (15) and on-base percentage (.392), the club released Val Pascucci (’01-’02) who has since latched on with the Camden Riversharks of the Atlantic League. • Out of baseball for a little over a year, Zack Segovia (’08-’09) returned to the mound for the Acereros de Monclova of the Mexican League. • Joe Bisenius (’10) was plucked from the Lincoln Saltdogs of the American Association by the Atlanta Braves who assigned him to Triple-A Gwinnett. • After batting .269 in 35 games for the Winnipeg Goldeyes, Leonard Davis (’08-’11) was released on Tuesday. • Clint Everts (’09), the former #1 pick of the Expos in 2002, was signed by the Sugar Land Skeeters where he joins a bullpen with former Senators Jason Bergmann (’05) and Roy Corcoran (’03, ’06). • JR Higley (’12) is manning the outfield for the Frontier League’s Evansville Otters. • Still chasing the dream, Dan Nelson (’10) is playing with the Phoenix Prospectors of the independent Freedom Pro Baseball League based in Arizona. This entry was posted in Roll Call and tagged Clint Everts, Dan Nelson, Harrisburg Senators, Jason Bergmann, Joe Bisenius, JR Higley, Leonard Davis, Miguel Batista, Roy Corcoran, Stephen King, Tim Pahuta, Val Pascucci, Zach Walters, Zack Segovia. Bookmark the permalink.